Since every other doll blog out there is reviewing the IT Toy Unveiling online yesterday, I'll think I'll skip writing something that's been repeated over and over. All I can say is my future silkstone Francie will find a friend in the upcoming Pretty in Purple Poppy Parker. So excited! And speaking of excitement, there is less than one day left until my trip to Japan! Yay! 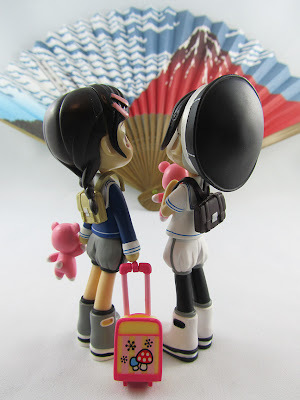 I will be bringing my trusty 4" travel doll, Little Nunu, as always. 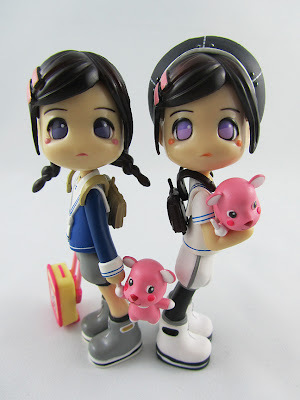 This time, her twin sister Chloe is actually coming. And what makes it so special is that they're going back to their homeland. For the plane ride, I've decided to dress them in matching sailor ensembles for that 'going-overseas' feel. Of course, they also needed to bring their teddys...Ya just can't leave those behind! I promise to post dolly adventure pics whenever I can in the two and a half weeks that I'm in Japan so please continue to stay tuned. Wish us luck that we don't get lost in the Tokyo transit! Hello there,TM!Greetings from Japan!Forgive my late reply--been very busy last week.. If you're from Tokyo, ride a densha or bus all the way to Iwaki eki (Iwaki station,Fukushima)then ride a kosoku bus to Ohno Interchange and when there,ride a taxi to Licca's Castle.It'll take 10 min. to go there. Thank you for your help Clarissa!